Oideyasu minasan. This is Yukkuri demasu! Another chapter for today. Tomorrow to will be one (hopefully). WARNING: The character common sense will be violated in this chapter. Please take care. Kazura, who had returned to the room, took out power tools from a toolbox packed inside a large cardboard box. At first, he thought to use a hammer and a saw for the work, but right now it would take too much time using those tools. Though the sounds were a bit conspicuous, but it was already dark, no other human presence nearby, and he also had an electric generator. It will be convenient for him if the work finished faster by using power tools. Kazura placed the power tools, lighting tools and other implements inside a nearby empty cardboard box, and then carried it towards the courtyard. While he was walking in the corridor while carrying the box, he met a maid that happened to pass by, who then opened the door towards the courtyard for him. Then while he said his thanks and pass through the door, he saw several objects flying in the night sky. Kazura looked up at the night sky and muttered those words. Then, the maid who noticed this looked up at Kazura’s line of sight. When he looked closely at the sky, there was a considerable number of bats flying around. If there was such large amount of bats then the flying insects that were gathered at the Estate might be more tremendous. Together with the maid, Kazura stared at the night sky for a while. When he came to himself again, he fixed the cardboard box he carried in his arms and then walked towards the courtyard where Isaac and Root were waiting. Kazura returned to where Isaac and Root were, put the cardboard box on the ground, and then took out the power tools and LED lantern. Again, this might be just a mere consolation for his mind, but they put the wooden boards leaning the generator and the cart at his surroundings and made a simple covered space between it and the building. He put the switched on LED lantern nearby, and then manipulated the switch at the generator so that it gave out the maximum output. At the moment he did this, the low sounds that the generator had produced until now, suddenly became louder, that the surroundings began to reverberate with the loud roaring sound. Disregarding Root who opened his eyes in surprise from this noise and Isaac who was looking around restlessly, Kazura took out the power cord for the electric saw and then plugged it into the generator. The electric saw that Kazura held was a circular saw type, it was a type where the circular blade will rotate at high speed to cut the material. After he received the square lumbers from Isaac, he placed them on the ground with a space between them. This served as a simple pedestal for cutting boards. Next, the boards that he received from Isaac were placed perpendicularly at the square lumber pedestals. The board thickness was about 2 centimeters, its width was about 30 centimeters and its length was more than 2 meters. As it is, the board was too big, so it must be cut into suitable sizes. With the measuring tape and permanent marker taken from the cardboard box, he measured precisely one meter and then put a marker to it. Then pinning the board with his knee, and applied the blade of the electric saw he held with both of his hand at the edge of the board. Kazura made his order and then began to activate the electric saw and cut the board. The high-speed rotating blade let out its distinctive cutting sound, the wood chips scattered around as it began to cleave through the board. Together with his father, Shinji, Kazura had used the power tools before to make wooden compost box for the field fertilizer back in his home, so he knew how to use an electric saw. Since Shinji had repeated time and time again, that it could result in serious injury if one’s not careful, Kazura knew this risk by heart. Isaac and Root were staring intensely at how the board was cut so easily with astonishment. To cut this sort of timber in this world, generally one will use a bronze or copper pull saw. Because it was a pull saw, it took a lot of time to cut the board, if someone does not use it right, it was normal that the blade would bend. As if to perfectly negate that common sense, the bulky board in front them right now, was being cut with a ruthless power by that small mysterious tools. Isaac had understood that the tools that Kazura owned have an out of common sense ability, but the event happening in front of his eyes had crossed his imagination by far distance. Kazura, who had finished cutting the board in 10 seconds, requested the next board, so Isaac and Root presented the next board to Kazura in hurry. Kazura received the board presented to him and then piles it on top of the board that he had just cut, then he put a mark next to the section that had been cut. Then, once again the electric saw began to cut the board. Kazura, who had cut the second board, stopped his work and called out to Isaac. Receiving the square timber that Isaac brought, he measured the length with the tape and then cut it with the electric saw. 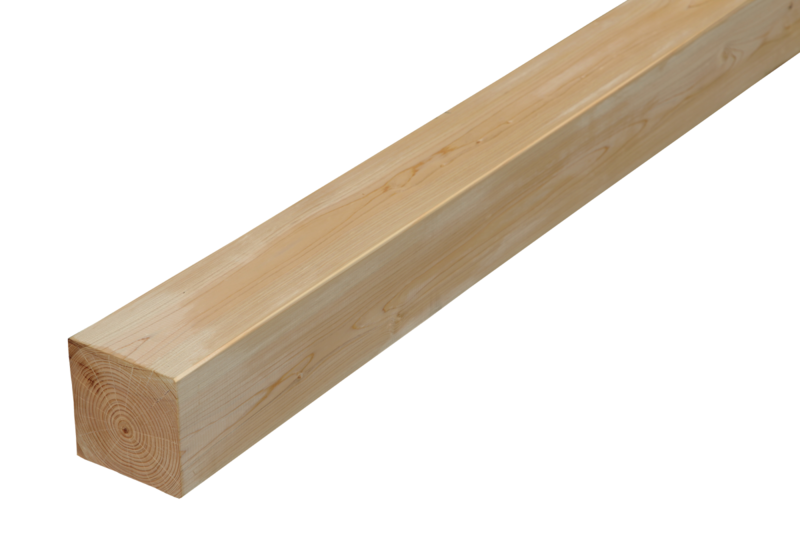 In the blink of an eye, two 1.5 meters long square timbers had been made. 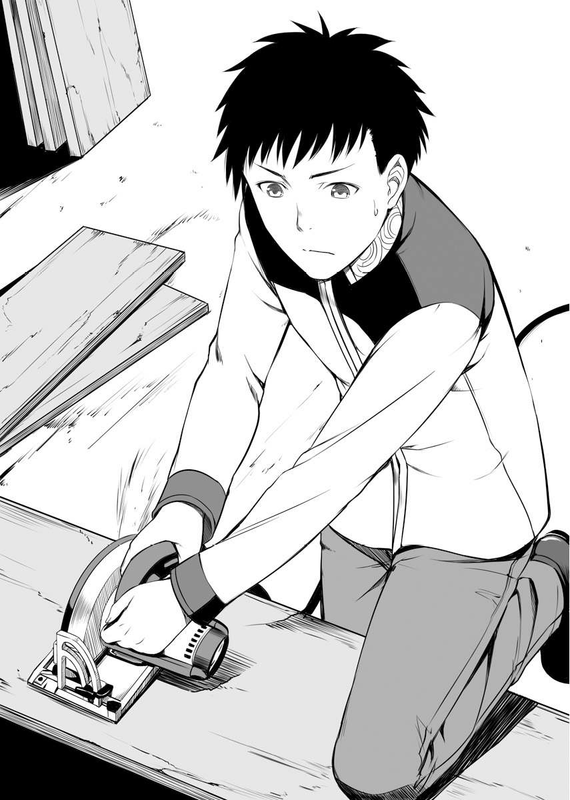 Kazura placed the square timbers that had just been cut on the ground with a 1-meter space between them, then he placed the boards that he had cut before atop of it, and then he took out a nailgun from the cardboard box placed nearby. This nailgun was a spring type, it was different from air pressure type that needs to be connected to a compressed air hose to be used. Its source of power was a battery and its nail load was 100. While grasping that Isaac was listening to Kazura’s explanation with a serious expression, Kazura pushed the nailgun on the part of the board where it met with the square timber. Kazura explained and pointed at the nailgun’s trigger, then Isaac kneeled down and brought his face close to nailgun to see it and then nodded. The nailgun was placed perpendicularly at the board and the trigger was pulled. *bash*. With a slight sound, the nail had been instantly driven into the board. Isaac received the nailgun from Kazura, then looked at its shape with an admiring sight. The figure of him placing his fingers on the trigger was strangely looked appropriate. Kazura warned him, so Isaac nodded and removed his finger from the nailgun’s trigger. Power tools are convenient things, but there is a risk of the mistake in its use might cause serious injury. So a thorough caution was necessary when handling it. And so, Kazura and Root was cutting the wood, while Isaac was building the wall. With this role division, the work continues. Thanks to the power tools, the construction work progressed favorably, in front of the three people a 1-meter side square box, or rather, a small shed for the generator had been finished. The small shed’s opening had copper hinges attached to it, it was a single door type. This hinge was something that had been requested to Root, who then searched throughout the Estate to obtain it. The lock was also something procured from the Estate, a bronze padlock was fasten to it. The small lock that the three had made, was placed on top of four pillars driven into the ground, there was a 10 centimeters gap between the wall and the ground surface. A generator in operation will release carbon monoxide. So that it could be ventilated by the wind, they created a gap. The pillars at the ground were buried about 40 centimeters deep, the base had been threaded down solidly, so it would be hard to dig it up. The roof was also been covered with the board without any gaps, which then tightly fixed with nails. In contrast with Kazura who looked at the small shed with a tired expression, Isaac sounds energetic. Root’s face was also a bit tired, but compared to Kazura, he was still looked better. When they were talking, they looked at the surrounding and noticed that someone was walking from the residence. After they returned to Nelson’s Estate from the fields, Havel was entrusted to tidying the carts and carriages, so he shouldn’t be informed about the work of constructing the small shed. Perhaps he had seen Kazura’s group working at the small shed from somewhere? It seems that Havel had been clearing people out for all this hour so that Kazura’s group could work easier. In spite of the sounds that they scattered during the work, there was no one visiting them, this was all thanks to Havel who had done many things at places unseen from them. Kazura made a dejected expression, so Havel quickly made a proper follow-up response. Beside Kazura, Isaac and Root too, made a dejected expression like him. Zirconia, who had returned to Nelson’s Estate from Leveson’s Mansion, was ordering the servants to convert a storage room inside the Estate into Marie’s room. In Japanese term, the room will be 8 tatamis wide, the interior was normally filled with several unused tables or shelves. When Zirconia was looking at the servants carrying the furniture out one by one, Marie came running from the corridor in a hurry. Marie arranged her breath and nervously bowed her head down to Zirconia. Zirconia spoke out in a soft tone as if to calm Marie down. Marie raised her head although she was still a bit scared. “Had I done something wrong?”, she was extremely worried. Suddenly being allocated to a new room and appointed to new duties, Marie was bewildered, but she still replied vigorously while bowing her head down. She completely didn’t understand what is happening with the sudden events but he understood that something amazing had unexpectedly happened. “Wage” was an unexpected word, so Marie was surprised and hardly made a move. Up until now, Marie was, more or less, received a wage from Leveson House, but that was just a meager salary in such amount that whether or not it exist wouldn’t matter at all. And then, this place had a high salary of 1000 Ar per month. Furthermore, she was allocated a personal room inside of the Estate, this was a generous arrangement. Really, what just happened was incomprehensible. By the way, the salary of 1000 Ar per month was the same amount given as the wages for Isteria guards or new recruit soldiers. Perhaps because to be able to redeem herself didn’t seem real for her, Marie was just nodding blankly. Though she had completely forgotten this since they were talking about the terms and the salary, but Zirconia remembered something that she has to be said. Just for caution’s sake, as more or less, it might become a trouble if she didn’t say it. Receiving yet another unexpected order, Marie had a cramp on her face. Wait… what are you talking about Zirconia? Kazura-san is not a lolicon (perhaps). Next chapter! Lieze Strikes Back! Kazura said Nailgun in English, while nailer machine was in normal Japanese. Normally, English words are not translated by whatever magic translator that Kazura used to speak with Arcadian people. The main house, and not on a separate servant building, like in Leveson Mansion. Oh my, things seem to be heating up for the Nepus. Zirconia: "And Issac can use the bath too." she was told to be ready if he asked for her not that she should wait for him in the bedroom, it will probably be brought up due to marie now becoming overly conscious of him but it should not cause any issues. I wonder if the nail gun was for brad nails or regular nailer. Can't help but be fixated on that for some reason. Also started to read the manga adaptation and I am thoroughly enjoying Valleta's cuteness overload, although releases are slow just like they are everywhere.